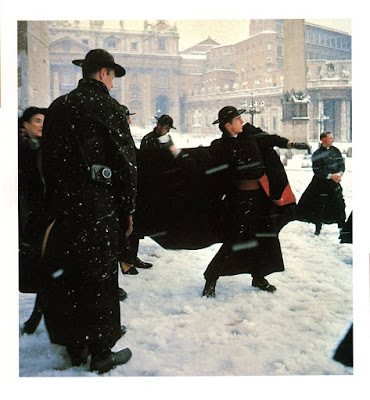 Our thanks once again to Fr Alex Schrenk, a priest of the Diocese of Pittsburgh, this time for sharing with us this marvelous photo of seminarians of the North American College having a snowball fight in St Peter’s Square. The exact provenance of the photo is unknown, but the date would be in February of 1956, when Rome experienced its heaviest snowfall since 1796. Many of the national colleges in Rome had a distinctive design for their cassock, the wearing of which was, of course, absolutely mandatory at all times; that of the North American had blue buttons and piping, and a red fascia, but was only used by students. (The use of such cassocks for formal occasions has made a bit of a comeback in recent years, and not just at the NAC.) Even without the fascia, the fact that they are enjoying the snow, and not desperately huddled around a radiator somewhere inside, clearly marks them as Americans.